Use the power of the Cloud to connect the Office and the Field. In the Field - Work Orders, Times Sheets, etc. Technicians complete work orders that have been dispatched to their mobile devices by providing details of the service provided, including work done, materials used and time spent. Technicians love it, paperwork is eliminated and phone calls are reduced. With Mobilio you will not only know what is happening in the field, but will get your information back to the office to streamline your billings and improve customer service. 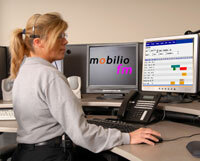 Dispatch, Schedule, Service Contracts, Quotes and much more. .
Mobilio provides your office with the direct connection between your technicians in the field and your office. Mobilio is a complete web-based and wireless field service management solution that will streamline your operations and make your business more efficient. Mobilio connects your office staff directly with your mobile workforce by utilizing your telephone providers data network to send mission-critical information to the office, including completed work orders and time sheets, in real time. You can use your existing notebooks with a wireless internet connection which is available from your mobile phone provider. Signature capture is available is also available with notebooks: If you need to capture signatures you can easily attached a signature pad such as the Topaz SigLite SL. 10" Tablet (convertible) - This is a compact / portable notebook that can be easily carried. PDA / Smartphones: The use of drop-down menus data entry is fast and easy. Signature Capture on Laptops etc. Topaz SigLite is a handy signature capture device that connects to PC's via the USB port. 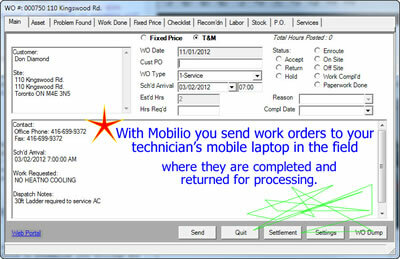 If your customers require a printed work order or sales slip, portable printers with bluetooth are a great option. If you have more questions and would like someone to call you please click on the link below and complete the FORM: more info. MobilioFM is a Web-Based software application. A web-based hosted solution where you can access the application software program at anytime and anywhere you have an Internet connection. This type of technology is also referred to as SaaS "software-as-a-service" or "cloud computing". Cloud computing or software-as-a-service is a where software applications are provided “as a service”, allowing users to capitalize on the flexibility of Internet ("the cloud") without needing to maintain a costly technical sophisticated infrastructure.